Crude oil prices have dropped 38% since June for two reasons. Shale oil production in the US Bakken, Eagle Ford, and Permian basins has increased dramatically – by more than 4 million barrels per day since 2008. At the same time, worldwide demand for crude oil has declined as a result of slowing economies in China and Europe. Starting in January 2012, the US crude oil benchmark, West Texas Intermediate (WTI), bounced around $100/Bbl (dollars per barrel), rose above $105/Bbl in June this summer, and is now trading below $65/Bbl. Natural gas prices fell below $2.00/mmBtu (dollars per million British Thermal Units) during April of 2012, rose above $6/mmBtu during the Polar Vortex during January of this year, and have since fallen below $4.00/mmBtu. 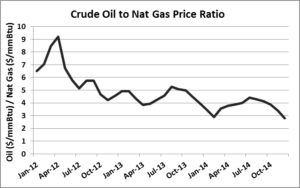 The graph below presents crude oil and natural gas prices on an energy equivalent basis in common units of $/mmBtu. Starting in January 2012, crude oil bounced around $17/mmBtu, rose above $18/mmBtu in June this summer, and is now trading below $12/mmBtu. 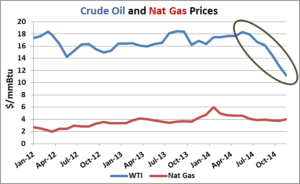 We reported previously on the once wide gap between crude oil and natural gas energy equivalent prices: Crude Oil and Natural Gas Get a Divorce and Crude Oil and Natural Gas Move To Different Hemispheres. During April 2014, crude oil reached more than nine times the energy equivalent price of natural gas. That ratio is now 2.8X. The graph below shows how this ratio has fallen over the last three years. As natural gas prices spike in pipeline capacity constrained markets this winter, it may be more economical to use fuel oil for power generation than natural gas. The economics associated with converting residential fuel oil furnaces to natural gas become less compelling. The economics associated with converting diesel or gasoline fueled vehicles to compressed natural gas or electricity will worsen, and the payback period associated with existing conversions will be extended further out in time. US liquefied natural gas (LNG) exports will become less competitive in overseas markets where natural gas prices are contractually tied to crude oil prices. Petrochemical facilities that can use both crude oil and natural gas as feedstock may switch more and more to crude oil. 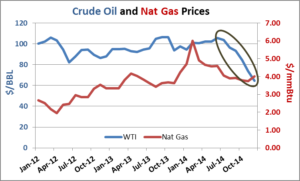 It now appears that crude oil and natural gas may be moving back to the same hemisphere and, possibly, reconciling.